Overall, the best feature of the LED powered LG HS102G is the way it performs to the expectation level you'd set for a higher priced projector. 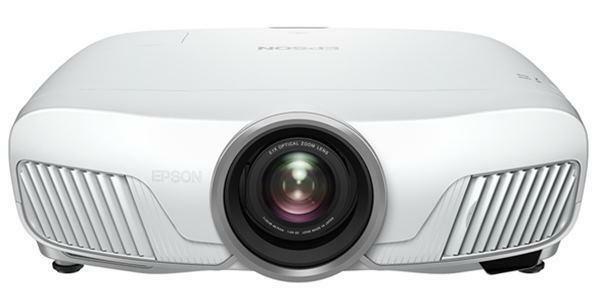 With a price of approximately $6001 (790,000 won in Korea) you get a 1.7 pound projector with 160 ANSI lumens, a native resolution of SVGA (800 x 600), and the ability to handle up to SXGA (1280 x 1024). It can handle standard video, widescreen video, data, photos or slides either as a live feed or from a USB memory stick. These solid features and easy setup make it a strong contender in the pocket projector market. 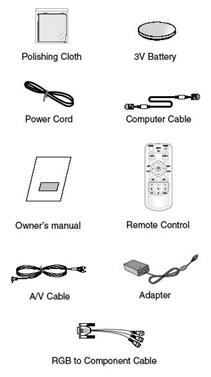 The LG HS102G comes standard with a VGA cable, VGA to component adapter, AV cable (composite video and audio), soft carry case, remote control, and power cords. For connections, the LG HS102G has one VGA input (shared computer and component input), one AV input, an audio output for external speakers, and a USB connection. The LG HS102G includes a built-in 1 watt speaker and an anti-theft Kensington lock. Using a standard matte white screen I put the LG HS102G through its paces using a Macbook Pro, Windows PC and a DVD player. Brightness - At 160 ANSI lumens, the LG HS102G is kind of a throwback when it comes to brightness. But when you factor in its small size, you'll be surprised at how well it performs. I was able to project an acceptable 36 inch diagonal image with lights on and daylight streaming through the windows. The LG HS102G offers two brightness settings, economy and normal. Fan noise is 23dB in economy and 31dB in normal mode. The difference in brightness between economy and normal is about 26 lumens (16%); however, fan noise is radically reduced by a factor of 6.3 in economy mode. I'd let the acoustics of the room and the ambient light dictate which setting best serves your audience. Light Source - With an estimated lamp life of 30,000 hours, the LG HS102G is another LED projector that you may have to include in your will. It uses PhlatLight™ LED technology from Luminus and should give you 10,000 presentations before you need a replacement. Resolution - The LG HS102G performs well in its SVGA native resolution and does a nice job compressing 1024 x 768 to fit the SVGA display, delivering very readable text in 12 point fonts or greater. Although you can go to resolutions as high as 1280 x 1024, the higher you go the more detail you lose with projected text being the first to suffer from the compression algorithms. Widescreen computer resolutions (1024 x 576 and 848 x 480) display in letterbox format and allow you to watch movies from your computer in their native aspect ratio. In all resolution settings and aspect ratios you have the option to expand the projected image to full screen. Color - Having tested many projectors that utilize DLP technology, I'm accustomed to the accurate color reproduction they provide. The LG HS102G is no exception. With both computer and DVD playback, the HS102G nicely displayed saturated colors and the multiple shades of those colors. Unlike many DLP Projectors, the annoying rainbow effect was very much subdued in the HS102G due to the "ultra-fast pulsing" LED light source. Video - With the DLP technology providing rich color and high contrast, watching video through the LG HS102G is a joy. Using a DVD player with the component video adapter, the picture quality was exceptional for a presentation projector. While it does not measure up to the performance of a dedicated home theater projector, the LG HS102G with its 2000:1 contrast ratio can deliver video in vibrant color. At present, DLP technology is the dominant technology for pocket projectors. 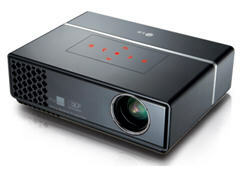 Portability - By definition, the LG HS102G is considered a pocket projector and weighs in at 1.7 lbs. But you won't have to stuff it into your pocket because LG includes a safari styled carry case that has room for the projector, accessories and possibly a mini laptop. A handy option of the LG HS102G is that it can be powered by a 9.6v external battery pack for up to 2 hours. This battery pack accessory from LG is not available in the US; however, third party products are available and compatible with the HS102G according to LG. Then, it's just a matter of choosing what you'd like to do - show photos, play audio or watch a video. You can even save your Powerpoint slides as jpg images on a USB drive and show your next presentation laptop free! How cool is that? Remote - I think this is the first time I've ever praised a remote control. Everything on the HS102G remote is efficient - the layout, size, access to menu items (aspect ratio etc.) and the feel and functionality of the buttons. Anyone who has had to dig through multiple layers of menus to solve an issue will appreciate this remote. Projector Controls and Manual Focus - Tweaking the manual focus on the LG HS102G without pressing the keypad on top of the projector is tricky. During my tests, I repeatedly bumped the touch sensitive keypad and changed the source, volume, and even hit the power button at times. The touch keypad looks great but doesn't work well in conjunction with the manual focus control. its purpose well, delivering quality images and enough features to make showing photos, videos, or presenting a breeze. The low power mode provides a quieter fan with an inconsequential loss of brightness. The ideal user for the LG HS102G is a traveling presenter who wants a solid, ultra-portable projector. The HS102G would also work in a conference room where groups can collaborate needing only a USB memory stick to show slides, photos or videos. Lastly, when it comes to movies, the LG HS102G will sparkle when displaying standard and widescreen video with its 2000:1 contrast ratio - a great solution for movie nights at home, provided you can successfully sneak the projector out of the office and back again for meetings the next morning. 1The U.S. price is based on the current exchange rate of the Korean won. Actual pricing may vary. Thanks for a great review. I've been watching the projector for a long time now, waiting for it to reach the US. I heard that LG announced plans for worldwide availability, any idea when it will be available in the US? Also, I noticed your article mentions an MSRP of $559 but the callout on this page mentions $777. Doesn't seem to be much different from the Dell (109S, I think), except maybe more expensive. I wonder if they're cut from the same factory. Why's it taking so long for 720p to get here? Seems like they want to sell us everything at least twice. 800 by 600 is a format of yesteryear so why flog it here when 720p is all over Asia? i want one of these buy ,but all the different images to be somewhere is not on the fan side, there is some I'm sorry my English is not good ! is this already available in the philippines? i'm interested to get this soon.... i just can't trust online transactions for purchases beyond $500. It is absolutely wrong. To compare this and Dell, you need check the detail specification before write. Got one love it, brilliant colour, easy to work and great for movie nights. Hi, I bought one of these little beauties and mine is an LG HS108r R stands for the colour 'red' and g stands for the colour 'green', other than that they are all the same. Hope that, that helps your query. I am impressed with its portable size and performance. But It is not able to recognize my USB 4 GB Pendrive and 320 GB hard disc. @ Srinivasa Rao - Try reformatting the USB drive as FAT. I'm guessing FAT will do the trick. You'll lose a little bit of storage space, but the FAT format is more universal. My projector LG HS 102 is showing white spots on right nd bottom corners on projection. What is wrong and what to do? Hello ! I want to ask about the lg projector. I wan to buy one, but I dont know without remote what I can do ? Can I turn it on without remote control ? And can I enter in the menu setting and play in the USB stick ? Many thanks.